Despite predictions that the housing market would slump in the wake of the Brexit vote, estate agents locally are reporting that the reality is quite different. St Albans based firm Leaders has reported a boost in viewings for properties in the area with agreed sales and exchanges all going through as planned. They have also reported that the levels of expected sales remain the same with little or no sales falling through as a result of the decision to leave the EU. Early indications seem to be that people for the most part just want to get on with business, whether as a vendor or a purchaser and whilst things may have been a little stagnant before the vote people now want to get moving – literally! All this is good news for the local industry as there were concerns initially that people may stay put. Understandably some were waiting for the outcome before making any big decisions about their futures but now people want to make the best of the situation. This local news seems to support the recent report from the Office of National Statistics showing that the UK economy grew in the months April to June by 0.6%. Their opinion was that the impact of Brexit was ‘limited’ and again supports the view that things may not be as bad as some expected thus far. Property resilience in Hertfordshire is not only good for the local economy but it’s also good for wider businesses that support movers locally too. There is also plenty of new housing and developments for buyers to choose from in Hertfordshire and the surrounding areas to help bring people to the area as well as move within it. Counties surrounding London were already doing well in terms of property so the news that this is likely to continue to grow is welcome. What the area boasts is that although property prices have increased in recent years there is a buoyant market for all kinds of buyers including first time buyers. With central London itself largely pricing people out of the market for home buying it is positive news that the commuter areas are driving growth and offering opportunities for all. Despite the negative connotations that Brexit has given in recent weeks it seems that local people are determined to make the best of it. Key to navigating future rocky waters could well lie in the success of local economies, particularly in relation to property. Staying positive and seeing the best that the local counties have to offer is essential in maintaining momentum gained prior to the vote. It is encouraging to note that the impact at this point is considerably less than predicted. Where Should Our Rubbish Go ? Comments Off on Where Should Our Rubbish Go ? Getting rid of unwanted waste is not as simple as putting out the bin for collection or handing it over to a rubbish removal team. Once the rubbish leaves our homes, it has to go somewhere, and it is not always easy for everyone to agree where it should be sent. Ideally, we want to get rid of our rubbish in a clean, safe and environmentally friendly manner, but we also have to think about how much it costs to handle different kinds of waste, and where our disposal facilities will be located. 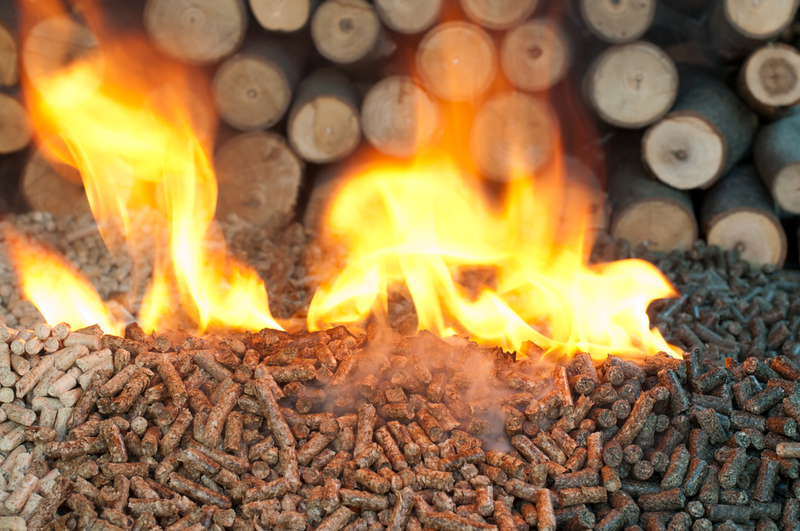 It is very easy to say that our garden waste and wood should be taken to a biomass facility where it can be turned into green electricity, but it is far less easy to decide where this facility should be placed, and who should end up living next to it. Nevertheless, rubbish has to go somewhere, and as we try to live greener lifestyles and find alternatives to tips and landfill sites as they reach their limits, we do have to choose locations for new recycling and waste processing facilities. Permission has just been given in the form of an environmental permit for one such facility in Potters Crouch, near St Albans. The site, which already played a role in rubbish removal in a former life as Wood Recycling Services, will now be converted by Navitas Environmental into a biomass facility processing up to 86,000 tonnes of dry wood waste collected by rubbish removal services from across Hertfordshire every year. The £60 million development will create 30 new jobs, as well as employing about 150 people during construction. It will generate 12 mega watts of renewable energy, which is enough power to supply electricity to 17,000 homes. The company intends to work closely with the local community to avoid any conflict, and hopes that the development will be seen as an improvement for the rubbish removal site, which has stood unused for some time. Locals, along with St Albans’ MP Anne Main, have raised concerns about the project because of the previous mismanagement of the site that led to a serious fire in 2012, but the Environment Agency has confirmed that restrictions will be placed on the amount of material that can be stored at the site, preventing similar incidents from occurring again. Farmers across the UK are struggling to cope with an epidemic of flytipping that is leaving fields full of unwanted junk and rubbish that could have been safely and responsibly disposed of at local licensed tips. The National Farmers Union released statistics showing that there were 711,000 incidents of flytipping in England alone in the year 2012-13. This works out as once every 44 seconds. Many farmers have suffered repeated problems, with people dumping unwanted rubbish on their land many times. The problem appears to be particularly bad in the southeast of the country. One farmer near St Albans told the BBC that he was finding items dumped on his land about three times a week, largely because his farm was one of the first pieces of open land on a major route out of the town. Clearly, the problem is much bigger than just a few people dumping their own rubbish without thinking about the consequences. Farmers can wake up to find several truckloads of rubbish has appeared in their fields overnight, since there are actually “professional” rubbish removers who are taking people’s money to dispose of their junk and then just dumping it as soon as they get out of town. 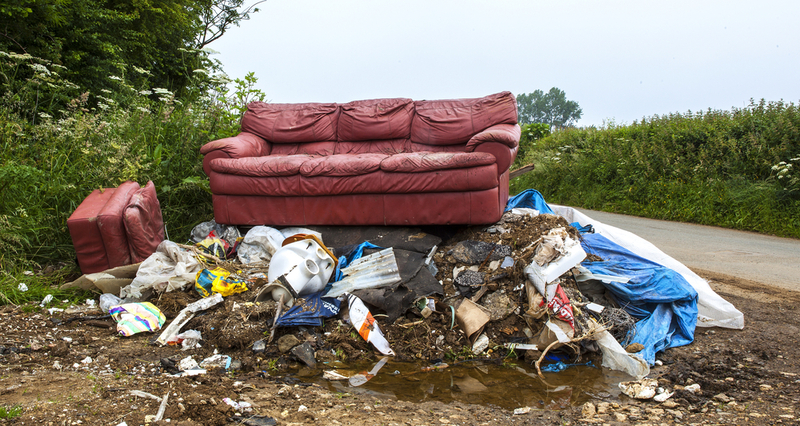 The NFU is now calling for people to take more care by selecting a licensed rubbish removal service rather than handing their money over to these flytippers. Many of the items that have been dumped on farmland could actually have been donated to local charity shops to raise money for good causes while making a new owner happy. Other types of rubbish could have been recycled rather than dumped, and used to produce more environmentally friendly new products. Even the rubbish that could not have been reused or recycled could have been treated better. Licensed disposal sites could have ensured that rubbish which posed a threat to health or the environment was treated appropriately. Farmers have found material such as asbestos and electrical waste that needs to be disposed of carefully in order to avoid risks to people, livestock and wildlife. All of these actions could have been taken to protect the environment if this waste had been handed over to a licensed company. Things That Might Go Wrong With Your Move ! Comments Off on Things That Might Go Wrong With Your Move ! Items get lost or broken – this actually happens more often than you think for one reason or another. Let’s face it, the majority of people have many possessions, and the more possessions you have the higher the risk of something being lost, or indeed broken. Take our advice: Hire a professional removals company such as us, we keep tabs on every last box you entrust us with, to make sure every single item makes its way from A to B safely. If things don’t get from A to B in one piece, professional companies like ourselves have comprehensive insurance policies to ensure your possessions are completely covered. Your removals company doesn’t turn up. Believe it or not this does happen. It’s frustrating, sickening almost – but there’s not much you can do on the day of your move, aside from renting a van to complete the removals yourself. This is another situation in which hiring a professional company such as ours will negate this risk – when you book us to move your belongings we’ll always turn up. There are no exceptions! The exchange of keys is delayed – this might mean that you’ll be homeless, temporarily. As soon as you hand the keys over to the person moving into your house, it’s time to set off for your new property. Without the keys to your new house however you won’t be able to get in. This only applies to people buying and selling properties as part of a chain. If you’re not in a chain, or you’re only renting, it’s not something that should concern you too much. Thinking the worst before your big move day might seem like a silly thing to do, but the simple fact is you can reduce the risk of the first two problems occurring by hiring a reputable removal company. Often people look for cheap removals companies without actually realizing that they’re cheap for a reason. Instead of looking for a company that offers the cheapest rates, look for a company that offers the best value. You might pay a little more than you would to some of the bargain basement companies out there, but you can rest safe in the knowledge they won’t let you down! Whether you’re in Luton, St Albans or Watford, we’re a professional, reliable removals company with a lot of experience and a long list of happy clients behind us. Call or email us today for a bespoke quote – we’re confident you’ll love the service that we provide! One of the problems associated with moving overseas is the fact you have to travel light. Sure, you might be able to hire a container to fill full of your possessions and ship abroad, but containers won’t usually be big enough to fit every last possession in that you own – including furniture. The best way to move abroad without spending a fortune on hiring a fleet of containers is simple: De-clutter. De-cluttering is simple – it’s the process of getting rid of those things you no longer need – things you haven’t used in ages, things you won’t use ever again, things that would otherwise add needless work to the task of moving home. We’re talking about those broken pieces of furniture stashed away in your loft – or those ancient football sticker albums at the back of your wardrobe that haven’t been exposed to the light of day for going on ten years. We’re talking about those things you simply don’t have a need or use for – so get rid of them! Some clutter might be worth money – you can either sell it yourself or donate it to a charity shop. Some clutter may be little more than rubbish though – and if that’s the case we can come and collect it for you. We offer a rubbish removal service here at TH Removals – we’ll collect any/all rubbish that you no longer need. All you have to do is call us, tell us how much rubbish you need us to remove, and we’ll attend your property and get rid of it for you. It’s amazing how much rubbish you’ll find during your attempts to de-clutter your home! Another way we can help is with the removal of old furniture and white goods. We even offer a free collection service for selected pieces of furniture (please contact us for further details). If you don’t have a car, or your car is too small for you to fit the furniture into, let us take care of the problem for you. Our vans are ideal for transporting furniture and other bulky items. Moving home can be stressful at the best of times – not least if you’re moving overseas! The thing to remember is that we’re always on hand to remove rubbish, furniture, white goods and other items that you no longer need before you embark on your life abroad. If you can only dream of moving abroad and you’re moving home within Watford, Luton or St Albans we can still help you – we offer a UK removals service too. Call us today to find out more about how we can help you! 1. 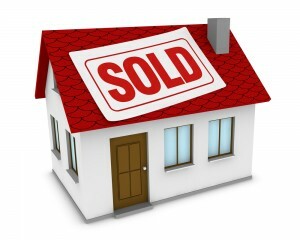 Time your sale just right – Spring and Autumn are the two best times to sell your home. Demand increases and inevitably prices do too. If you fail to time your house sale correctly, you could end up waiting a long time for potential buyers to show interest. 2. Tidy up! 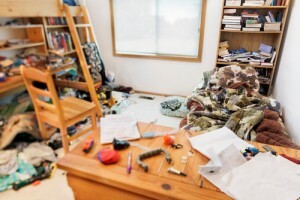 You wouldn’t believe how many people show prospective buyers around their home when it’s looking extremely untidy. You need to make your home look as appealing as possible to potential buyers – you’ve got to do everything within your power to make them want it. Would you want to live in a house if it looked like a pigsty when you went to view it? Tidying up goes for the outside too – the front garden is often the first thing a viewer will say, make sure it creates a great impression. 3. Get rid of things you don’t need. Not only will your house look uncluttered when people come to view it, it’ll be easier to move once the house is sold (because you’ll have less things to shift!). Look through your possessions and furniture objectively and get rid of anything you don’t need. You’d be amazed at how much junk the average person tends to accumulate! 4. Redecorate or touch up around the house. Redecorating is obviously rather expensive whether you do it yourself or pay someone else. That said, redecorating adds value to a property because people see it as something they can just move into – somewhere that won’t need work when they move in. If you don’t have the time or money available to redecorate your property, why not just touch it up instead with a bit of pain here and there? 5. Be prepared to accept offers – it’s part and parcel of selling your home. Don’t be tempted to accept ridiculous low-ball offers, but do listen to reasonable offers that are fairly close to your asking price. If you’re not going to entertain offers then make sure you set a realistic, fair selling price – otherwise your home will never sell! When you’ve managed to sell your home and the wheels are in motion for your house move, remember to call us! We can move your possessions from A to B with minimal fuss and at the best possible rates. We’re a full service removals company operating throughout Watford, Luton and St Albans. Pick up the phone and call us today to find out more about how we can help you! OK, so you’re moving house in the near future and you need to find a professional, reputable company that will transport your possessions safely to your new property. In this blog posts we’re going to look at five top tips that every mover should consider when hiring a removals company – no matter where you are in the UK ! It’s a good idea to hire a local removals company for a plethora of different reasons. Local companies know the area – they know the best and easiest route to get from your old house to your new house. If you’re lucky, you’ll be able to hear recommendations and feedback from other people in the area that have used the firm in question too. It’s always nice to hear other people’s experience of the company. It might be tempting to hire a national firm because they have flashy TV adverts or an amazing website, but the simple fact is that national firms can’t pay as close attention to detail as smaller, local firms can. Insurance is really important on many different levels. First and foremost you need to be 100% sure that your possessions are fully insured against loss or damage during the removal process. Sometimes you’ll be insured through your own house contents insurance policy (look for the “in transit” clause). If not, you need to ensure the removals company you use has adequate insurance for your possessions. As well as insuring your personal possessions you also need to make sure the removals company has liability insurance to cover their employees and the general public. There’s no use hiring a removal company just a few days before you move home. It can cause unnecessary last minute panic and stress. Always look to hire a removal company in good time – at least a few months ahead of the removal date where possible. By hiring a removal company in advance you can get on with other aspects of arranging your house move – you can rest with peace of mind that transporting your possessions is all in hand. 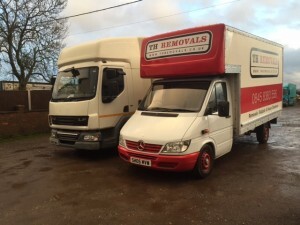 Different removal companies offer varying levels of service. Some companies will offer a full service including the packing of your possessions. Others will collect your possessions form your doorstep, and deliver them to the doorstep of your new property. Decide exactly how much (or how little) assistance you require and hire accordingly. Remember it costs more to have a removal company pack your belongings for you too – so if you’re on a tight budget it may make sense to do it yourself. Hiring a removal company has the potential to go wrong in a very big way. There are lots of cowboys out there – so hire carefully! Here at TH Removals we’ve got a track record of providing an exemplary level of service to our customers. We offer competitive rates and we strive to be the very best. So if you’re based in or around the St Albans or Watford area and you need to hire a reliable removals company, call us without delay ! Is your new home insured ? Comments Off on Is your new home insured ? The moving process can be long, drawn out and extremely stressful. In your battle to keep on top of things there’s a good chance that you’ll overlook one very important thing: Insurance. Few buyers realise that it becomes their responsibility to insure a property from the second that contracts are exchanged – not when they get the keys to the property on the day that they move in. Whilst the likelihood of your house burning down or dropping off the face of the earth is slim at best, there’s always a chance that it could happen. Therefore, it’s important to ensure your new property is covered from the word go. Buildings and contents insurance are often issued on joint policies. The problem is that when purchasing a new house your buildings insurance should be switched to the new property when contracts are exchanged – but your contents insurance cover shouldn’t be shifted until you actually move house. Therefore you should pay a great deal of attention to your contents insurance policy both before, after and during the move. It’s especially important to find out whether or not your contents are covered during the move process itself, and if so, who by. Sometimes you’ll find that your possessions are actually insured via your own contents insurance policy. Some policies (not all) have a clause in there that covers “items in transit”. Don’t just assume your policy has this clause in it – look through the policy wording or call the insurance company to get confirmation. If your policy doesn’t feature this clause, you’ll need to hire a removal company that insures your contents for you whilst they’re being moved. Is your removal company insured ? Aside from building insurance, you should also consider the removal company you’re using. Are they insured? If so, for what sum? It’s really important that the company you use to move your belongings are insured – if anything goes missing or gets broken you can then claim for the cost of it. It’s not just your goods that need to be insured either, the employees from the removal firm need to be ensured too. If they cause damage to your property or become injured whilst working on your house move, they can then make any claims from their employer. Finding out whether or not your removals company is insured or not is really easy. Just pick up the phone and call them! You should try and get it in writing too when they present you with a written quote, or when they issue an invoice to you. Whilst we can’t help with building insurance, we can assure you that here at TH Removals our fleet of vehicles is fully insured with public liability insurance cover of up to £1 million. All of your belongings and possessions are fully insured to £15,000 per load. When you use us for your house move. We offer our services to those living throughout the St Albans and Watford areas, so what are you waiting for? Pick up the phone and talk to us today to see how we can help you !